There are two types of books coming out about the 2016 election. There are books from Clinton partisans which paint her as the victim and blame Russia, James Comey, and/or misogyny. These books do a disservice to Democrats, blinding them as to why they lost an election which should have been easy to win against Donald Trump, and increase the risk of Democrats continuing to lose. There are also the honest accounts, including the one quoted by Matt Taibi a few days ago. Last week I also posted an excerpt from Shattered: Inside Hillary Clinton’s Doomed Campaign by Jonathan Allen and Amie Parnes. The book will be released tomorrow, and I have my order in at Amazon. 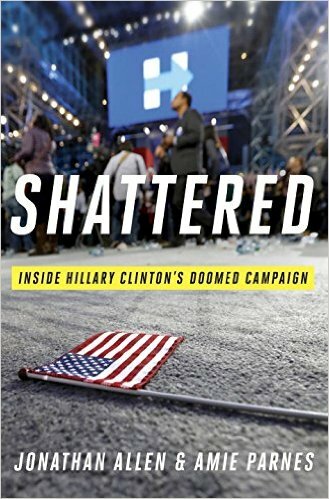 In their compelling new book, “Shattered,” the journalists Jonathan Allen and Amie Parnes write that Clinton’s loss suddenly made sense of all the reporting they had been doing for a year and a half — reporting that had turned up all sorts of “foreboding signs” that often seemed at odds, in real time, with indications that Clinton was the favorite to win. Although the Clinton campaign was widely covered, and many autopsies have been conducted in the last several months, the blow-by-blow details in “Shattered” — and the observations made here by campaign and Democratic Party insiders — are nothing less than devastating, sure to dismay not just her supporters but also everyone who cares about the outcome and momentous consequences of the election. “Our failure to reach out to white voters, like literally from the New Hampshire primary on, it never changed,” one campaign official is quoted as saying. There was a perfect storm of other factors, of course, that contributed to Clinton’s loss, including Russian meddling in the election to help elect Trump; the controversial decision by the F.B.I. director, James Comey, to send a letter to Congress about Clinton’s emails less than two weeks before Election Day; and the global wave of populist discontent with the status quo (signaled earlier in the year by the British “Brexit” vote) that helped fuel the rise of both Trump and Bernie Sanders. In a recent interview, Clinton added that she believed “misogyny played a role” in her loss. The campaign frequently spun its wheels in response to crises and urgent appeals from Democrats on both the state and national levels, the authors report. Big speeches were written by committee. “Evolving the core message” remained a continuing struggle. And the Brooklyn campaign headquarters — which would end up outspending Trump’s campaign by nearly 2 to 1 — frustrated coordinators in battleground states like Colorado by penny-pinching and cutting back on television, direct mail and digital advertising. After a planned appearance in Green Bay with President Obama was postponed, the authors write, Clinton never set foot in Wisconsin, a key state. In fact, they suggest, the campaign tended to take battleground states like Wisconsin and Michigan (the very states that would help hand the presidency to Trump) for granted until it was too late, and instead looked at expanding the electoral map beyond Democratic-held turf and traditional swing states to places like Arizona. The mistakes made during the campaign were consistent with Clinton’s long history of poor performance in whatever government role she was in, along with her losing 2008 campaign against Barack Obama. Hillary Clinton has repeatedly shown that she lacks the judgement to handle a high political office. Rather than learning from her mistakes, she continues to repeat the same mistakes. This has been seen on policy matters, such as when she repeated the same mistakes in her policies on Libya and Syria as she made in backing the Iraq war without even reading the intelligence material prepared for members of the Senate, as well as in political campaigns when she lost to Donald Trump by repeating the same mistakes she made in running against Barack Obama and Bernie Sanders. Donald Trump is now looking like he is at risk of turning out to be one of the worst presidents in our history. Hillary Clinton, with her poor judgement and the blind support of many Democrats who ignore her mistakes and corruption, very well could have done even more harm to the country. Update: More at The Washington Post. Another review at NPR. Axios has a list of additional highlights. It is quite valuable how this book is changing the media narrative to a factual discussion of how Clinton mismanaged the campaign as opposed to continuing to hear Clinton’s excuses for why she lost. Posted in Barack Obama, Bernie Sanders, Donald Trump, Hillary Clinton, Iraq, Politics, Scandals. Tags: Barack Obama, Bernie Sanders, Donald Trump, Hillary Clinton, Iraq, James Comey, Libya, Russia, Scandals, Shattered, Syria. RSS feed for comments on this post.. TrackBack URL. It was not just the Presidential race that the Democrats lost. They also lost further in Congress given the Republicans both the executive and the legislative branch. The later affirmation of Judge Gorsuch to the Supreme Court also give the Republicans a boost in the judicial branch. Hillary was a total, three branch disaster.